Pie Face Game Just $12.99! Down From $20! You are here: Home / Great Deals / Pie Face Game Just $12.99! Down From $20! Right now you can get this Pie Face Game for just $12.99 (Reg. $20) at Walmart! Uh-oh — you’ve got a little something on your face! 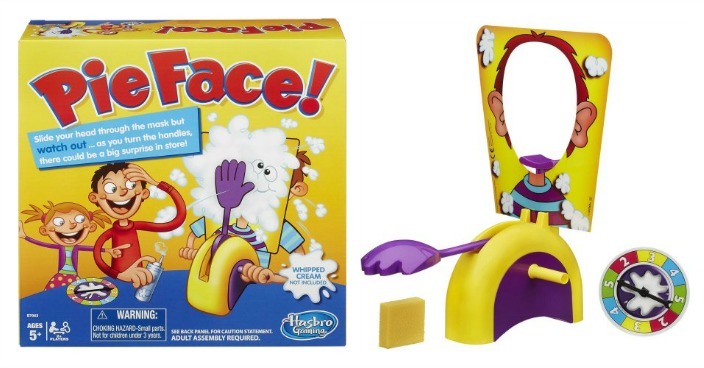 You and your family will get a kick out of the thrilling Hasbro Pie Face game! To play, just apply some delicious whipped cream — or even a wet sponge on the hand lever, then start turning the handles and let the anticipation buil — you’ll never be able to guess who’ll get pied next. So keep your fingers crossed, and hope you’re not the one who gets a splat in the face! You score a point for each time you turn the crank without getting hit, and the player that scores 25 points first is the winner — it’s risk-taking at its most hilarious. The Pie Face game requires some assembly; made for ages 5 and up. To clean, just wipe with a wet towel or rag.